This engaging read presents a student-friendly overview of the life and accomplishments of Julius Caesar with special emphasis on his family background and early life. The biography is based not only on the traditional sources-Suetonius and Plutarch-but also on the private correspondence and observation of Caesar's contemporaries-both his friends and his enemies. Based on these sources, the book demonstrates that Caesar was a very determined individual who developed and largely managed to execute a series of original responses to the unique situations of his times. 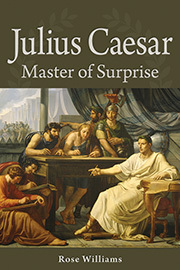 Julius Caesar: Master of Surprise is a must-have title for all high school Latin programs. Thoroughly accessible to readers of all ages and backgrounds, and an excellent resource for teaching high school or college students, Julius Caesar: Master of Surprise reveals the incredible wisdom and cunning of this legendary Roman emperor. Rose Williams, who has taught high school and college students about Caesar for over thirty years, draws upon multiple historical sources to recreate Caesar's military and political career including the writings of Suetonius, Plutarch, and correspondence/observation of Caesar's contemporaries. Highly recommended, especially for high school and college library biography shelves.